To lighten the left menus by grouping different “views” (Calendar, Gantt Charts, Task Lists and Reports) or lesser-used left menu items (Statistics, Discussion Forums, Mailbox, User Directory) under a single left menu item. To eliminate what amounted to interface page duplications (for instance, project lists could be found both under the Portfolio and My Office tabs). In the process, all items that used to be under the Portfolio or My Office tabs were merged into what is now the “Home” tab. To facilitate access to more commonly used left menu items by making shortcut options appear directly below the Home and Project tabs when these are clicked. 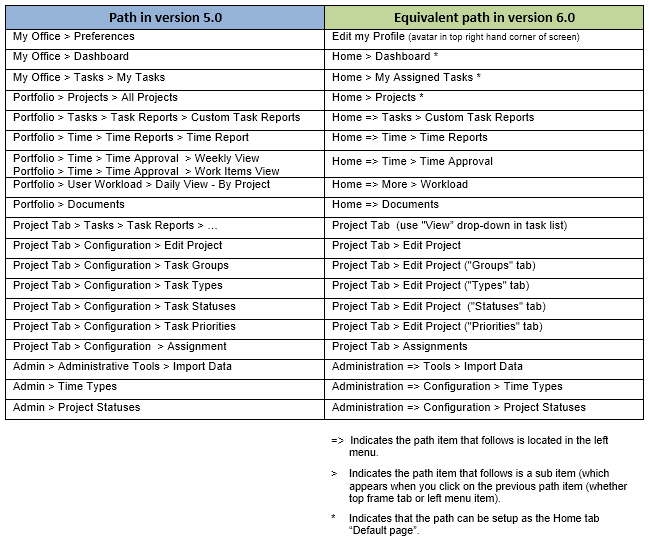 The following table shows the path to some of the most frequently viewed pages in version 5.0 and their equivalents in version 6.0.